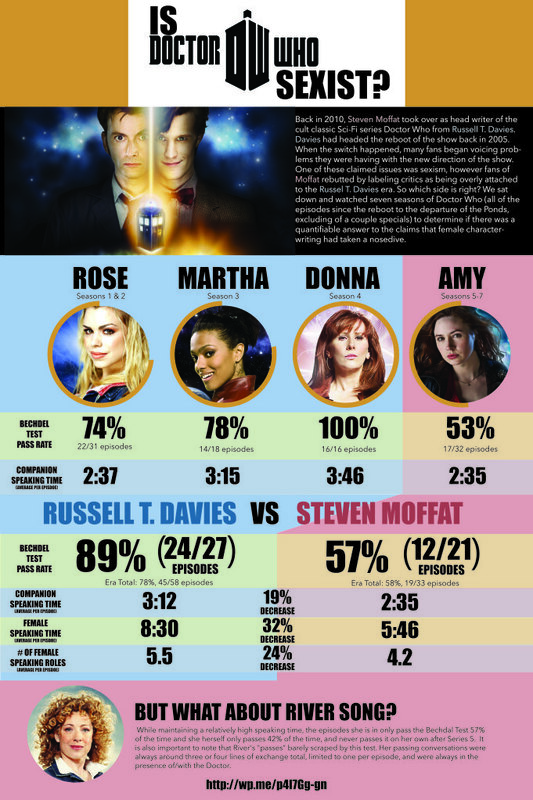 I love Rose and Martha the most. I don't dislike Donna, but she wasn't my fave. River was alright at first. My opinion on Amy depends on the episode. Haven't seen much of Clara's run so far, so don't really have an opinion on her. I also love Gwen Cooper. Would have loved to see more Gwen/Rose (and Martha/Rose) interaction. I hate when sexist etc people think that by denying their own prejudices it negates them somehow. Stop being offended by being called a sexist and start being offended by your own sexism. I wish they'd just sack him already, and bring in someone who can actually write women as people. Unfortunately moff's run has really high viewer ratings and Matt smith's face+body were really getting bringing fangirls and some fanboys into the show. Ugh, true. They'd need a hell of a writer to justify replacing him at this point. I want Doctor Who to keep high ratings and stay in production, but...Moffat. I don't watch Doctor Who but I totally believe the complaints that are being made against it. That being said, Moffat created Press Gang...which was so brilliant for a kids show. I haven't watched it in years so maybe it doesn't hold up but I don't get how he can go from writing a great female character like Lynda to not being able to? I wonder what happened. I think it all boils down to what he thinks drWho is and what it isn't. He seems to be missing some major elements of doctor who. He was a fan as a child and now he gets to write it. and he also doesn't keep a tight reign on all the other writers. Moffat usually only writes the first and last episode and the specials. All the others are done by people who make there own spin and he doesn't really police them. RTD's era as the head was tightly controlled. He didn't let others change or redact anything he did nor have a say in his stories.